IUF Korean affiliates and KFSU affiliated Pizza Hut Labor Union showed their solidarity with the ongoing struggle of PepsiCo warehouse workers in India at May Day Rally in Korea. IUF members marched in front of Lotteria, a chain of fast-food restaurants in East Asia which serves PepsiCo products and protested the ongoing human rights violations of PepsiCo in India. 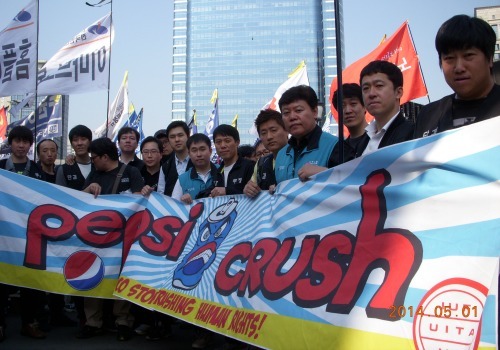 KFSU affiliated Pizza Hut Labor Union members called on PepsiCo to stop crushing human rights.